ONLY IN THE CONGRESS would as daft a piece of legislation as S.770 be called immigration reform. This is not to say that our current immigration system isn’t in dire need of reform. Anyone who knows anyone who has tried to legally enter the country is well aware that our current system tends to be discriminatory and slow. It is full of arbitrary limits with neither rhyme nor reason. Capricious rulings from faceless bureaucrats rule the day. Unrelated to the immigration system is the issue of border security. Everyone seems to recognize that our borders are as porous as cheesecloth. The Mexican border, in particular, has become a dangerous and unruly place. Mexican drug cartels have more control over the expanse of desert than our government, with numerous deaths to both US and Mexican citizens resulting from the insecurity. In the meantime, millions of Mexican citizens routinely cross over to the US without permission. Some return. Most do not. These are not new problems. In 1986, we had our first go-round with “comprehensive immigration reform.” We granted immunity from prosecution or deportation to some 3 million illegal immigrants and we changed the criteria for obtaining visas, green cards and eventual citizenship for future immigrants. Included in the “comprehensive” solution was supposedly upgraded border security. I supported that effort, partly because I couldn’t see anyway to round up and deport 3 million people, partly because the border would be secured and partly because the path to legal immigration was made simpler for future immigrants. I felt it better to have those illegals legalized and paying taxes than using government services from governments they had no real stake in. Yet, here we are some 27 years later and the same problems that existed before the 1986 legislation not only still exist, but are worse than before. We now have somewhere around 11 million illegal immigrants living in the US, the border is hardly secure, and the path for legal immigration is more cumbersome and frustrating than ever. The legislative response this time? A repeat of the 1986 legislative failure. For the life of me, I can’t see how anyone with more than three working brain cells can think this is appropriate. 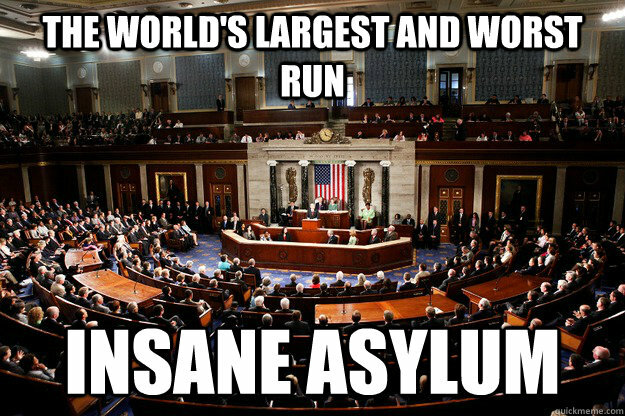 And since the colloquial definition of insanity is doing the same thing over again and expecting a different result, I can’t see how anyone could look at the current legislation and not come away convinced that our Senators are insane. As I mentioned at the top, I still believe our immigration system is in need of a serious overhaul. Not just a reform of the current immigration laws, but an all-out overhaul. If the Congress wants to strip down the current system and start from scratch, I’m fine with that. Heck, I would be really, really happy if they did that. We also need border security. It should be a top priority and it shouldn’t be something that takes Congressional action to accomplish. After all, the Executive branch is responsible for maintaining border security. Yesterday, Sen. Lindsey Graham (a man quickly approaching Sen. John McCain for the “Most Senile Senator” award) told Chris Wallace that the border is “virtually militarized.” Well, that approach obviously isn’t working. I’m certain if the administration actually did militarize the border, there would be howls from the left. But I’m also certain that an infantry division patrolling the Rio Grande and another patrolling the Desert Southwest would be far more effective in maintaining border security than anything else we’ve tried thus far. And we need to decide what to do with the 11 million people here without visas. I don’t think we’re any more capable of rounding up 11 million criminals today than we were capable of rounding up 3 million criminals 27 years ago. I don’t think they should be allowed to stay, either. I do think there is a very simple and cost effective way to have them return to their country of origin, though: deny them the means to live here. Make it impossible for them to work. Deny them the ability to rent a house or apartment. Deny them government services of any type. Give local governments the ability to turn over those here illegally to federal officials, and make it mandatory that anyone here illegally be immediately sent back home. Not all will “self-deport,” but more than the vast majority will. Human nature is human nature – once deprived of the means to support themselves or their families, they’ll move on to greener pastures. What is certain that a repeat of the 1986 “comprehensive reform” package will get us, well, a repeat of 1986. Which means in 2040 another bunch of Senators will be discussing what to do about the fact there are more Mexican citizens residing in the US than than in Mexico, why the borders have become deadlier than ever and why the US cannot find (and keep) highly qualified people to emigrate here. This entry was posted on June 24, 2013 by Ray Rothfeldt. It was filed under American History, Politics and was tagged with Immigration, Immigration Reform, legal immigration, mexican drug cartels. the perfect picture, thank you.